These plugs provide an eye-catching conversation piece; they are a must-have plug for any occasion. You will receive 6 pairs of double flared plugs screw fit with screw fit on one side making it simple for your plugs to put on and stay in place. Each set of 12 pieces will be 1 size gauge. You will receive 6 Pairs of screw fit plugs of the size you select of the size you select. 6 Pair stainless steel screw ear gauges flesh tunnels plugs expander 6 colors - 12 pieces at the same Size you selected. 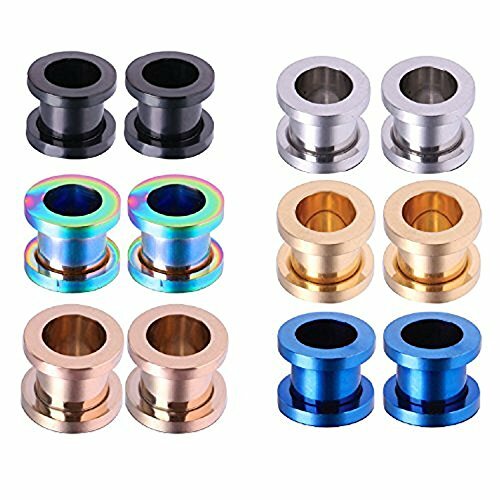 VALUE PACK: 6 Pairs of Surgical Stainless Steel High-Polish Double Flare Screw-Fit Flesh Tunnel 12 Pieces of Ear Lobe Piercing Earring Stretchers. MEASUREMENTS: Thickness Gauge Plugs Size: 00G (10mm) Ear Tunnels Hollow Plugs Stretcher Jewelry Double Flare Screw Fit For Body Piercing. MATERIAL: High Quality Stainless Steel Jewelry is Very Strong, Provides Lasting Color Retention, is Resistant to Tarnishing and Extremely Easy to Clean. COLORS: Screw Fit Tunnel Screw Rings of The Size You Select. Pair of Black, Pair of Goldtone, Pair of Rose Goldtone, Pair of Rainbow, Pair of Blue And Pair of Silvertone. SATISFACTION GUARANTEE: All BodyJ4You Items Are New And Unused. Guaranteed Satisfaction As We Offer 90 Day Money Back Guarantee. If you have any questions about this product by BodyJ4You, contact us by completing and submitting the form below. If you are looking for a specif part number, please include it with your message.